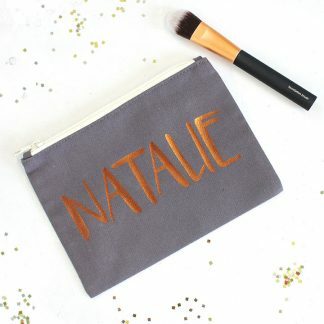 Bring a little metallic shine to someone’s world with one of our personalised make up bags. Let us know their initials and we’ll apply them to this fully lined 100% cotton make up bag with a selection of 80’s styled lips in metallic champagne, silver and white glitter. Fastens with a neutral coloured zip. This perfectly sized make up bag would make a lovely gift idea. Spot clean only. Please note that the initials will appear in uppercase in metallic champagne colour.